Wine is the lifeblood of Spain. Pure and simple. It is tradition, culture, gastronomy, family and an intricate part of life here.There’s hardly a region that doesn’t produce the noble fermented juice. 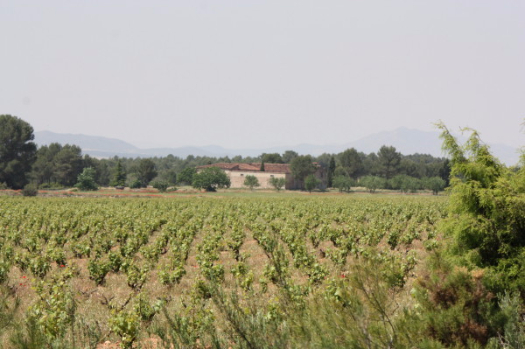 It’s three thousand year old industry, which since Phoenician times has thrived across the peninsula, has helped carve out Spain’s fabulous scenery with its hundreds of thousands of vineyards. Ingrained in the culture of most of the country, it goes hand in hand with Spain’s gastronomic world of tapas, pintxos, paellas, roasts, fish dishes, seafood and, of course, is ideal for drinking with friends and family. And it also provides important jobs and income. Interestingly, after all these years there is a new phenomenon in the wine industry, which is not really new but a reinvention of where wine came from. Not that long ago in rural areas most households, made their own wine in some form or another, which was drunk during the year until the next harvest. This tradition has slowly waned over the last century leading to a wine industry based on anything from small to large bodegas and in the last twenty years a resurgence of much smaller independent family run wineries. However, in the last to five to ten years years there are suddenly numerous garage wine producers and microwineries. These super small operations often produce wine in their own garages,small industrial garages or units using modern machinery but with minimum intervention in the vineyards and in the winemaking. These garage wine guys are making some fun and interesting wines in a very limited fashion both in bodega space and wine volume. And they make wines from obscure grape varieties as an increasing percentage of the Spanish wine consumers, especially the younger generation, appreciate local diversity and little known grape types. Fil.loxera & Cia are a perfect example of this trend and are one of the first to pioneer this idea in Valencia.They literally make their wines in their patio and garage. Producing around 18,000 bottles a year, they have spent the last five years growing slowly and managing the logistics of having a winery in their house. Barrels and bottles are all stored actually in the garage making all the operations difficult in terms of moving wine for maturing or bottling, from one place to another. 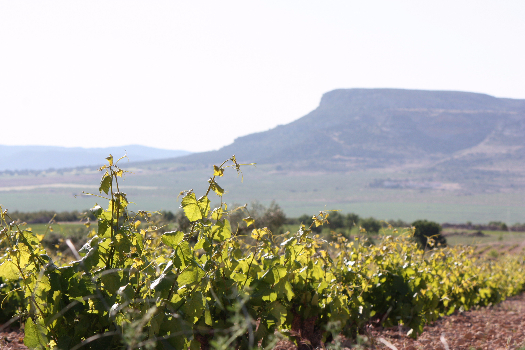 Based in DO Valencia’s town of Fontanares dels Alforins, this microwinery is run by three partners Pilar,Jose and Joan, who have an unbridled passion for wine and winemaking. They have their own vineyards which include some of the most typical Spanish grape varieties such as Monastrell and Tempranillo but they also have obscure local varieties such as Arco which makes an amazing very limited production wine.They recuperated this variety when they saw a neighbour begin to rip up some old vines which they knew to be very special. After taking on the vines off the neighbour they have now spent three years squeezing out enough production to make a fab and very different wine:Sentada sobre la Bestia (Blue label version). They also are working with a fascinating obscure red variety called Ull de Perdiu (Partridge’s Eye in English) and a white called Valenci. 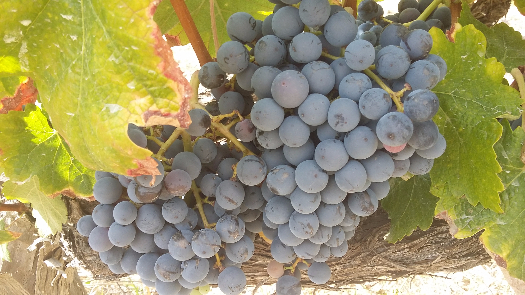 Besides recuperating these funky old grapes from their grandfather’s time they also work hard in the vineyards to ensure minimum intervention and rely totally on annual rainfall.No irrigation. Walking around their vines you can see how weeds are apparent between their lines of vines and how close their vineyards are to pine forests and mountain herbs like rosemary and thyme. 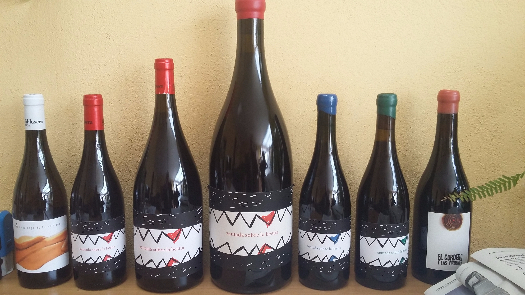 Even though they have the very limited production of extraordinarily cool wines like the Sentada Blue made from the recuperated Arco variety, their most popular wines are the red wine Sentada sobre la Bestia(red label) and Beberas de la Copa de tu Hermana which is anything but your typical local white. 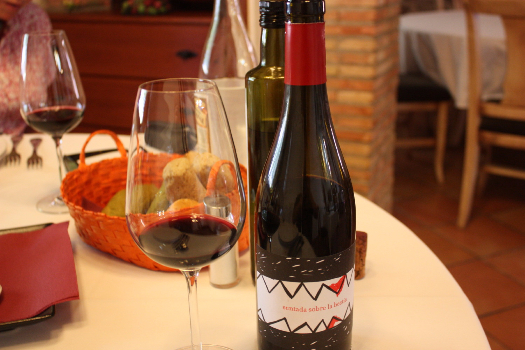 Sentada is a rich and easy drinking Mediterranean red which reflects the local landscape of mountain herbs and uses mostly Monastrell with some Tempranillo, Garnacha and Malvasia. 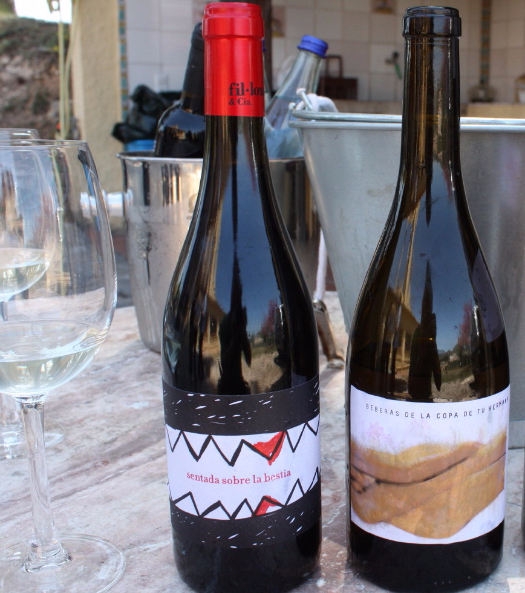 Whilst Beberas… is a made from a blend of Macabeo,Malvasia and Monastrell and has a particularly robust almost woody tang to the palate.Exquisitely surprising for this part of Spain, as most wineries have been looking to make light, fresh whites. Pilar,Jose and Joan make have achieved something really special ,to produce quality wines in their garage wine which really are very cool. You can check them out in the UK at Ultracomida and Curado Bar. This entry was posted in bodegas, Food and wine in Valencia, garage wine, Spain, spanish culture, Spanish wine, Valencia, vineyards, vino, wine, wineries and tagged bodegas, garagewine, Spanish wine, wine, Winemaking, wineries by Paddy Waller. Bookmark the permalink.